You might think of today as April Fool’s Day, but it’s my Dad’s birthday! Because he brings the Italian side to my ethnic background, I needed to share an Italian-American dish today. 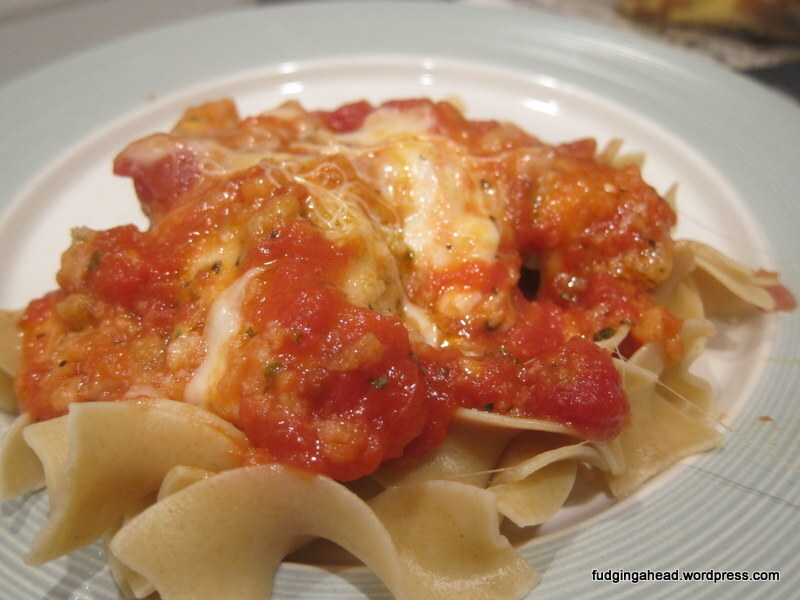 Chicken Parmesan is a nice simple dish that works well during the week. I like that I can start it in the oven and then relax a bit when I get home from work. The 30 minutes is enough time to even take a shower, or just work on the vegetable side dish. 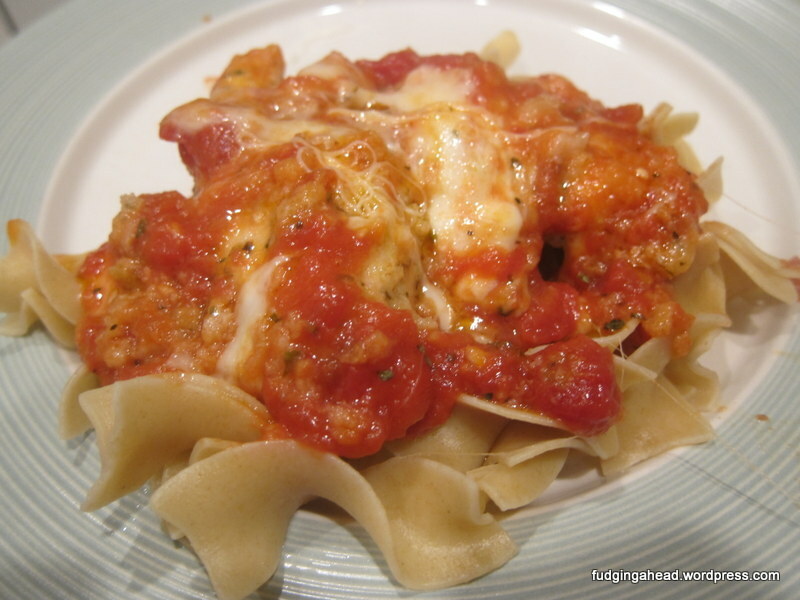 You can serve it with pasta like I did, or make some garlic bread on the side. If you are limiting your carbs, then feel free to leave it out entirely. I promise that this dish is easy for anyone. You can even play around with the seasoning depending on what you have. If you don’t have one or the other for panko and bread crumbs, feel free to use all of one kind, but I like the mix to evenly coat the chicken (bread crumbs) and have texture (panko). The olive oil idea replaces the common method of dipping the chicken in egg. It was inspired by this recipe and it worked much better than eggs, as well as adding a small amount of flavor. Preheat the oven to 350 degrees. Prepare a baking dish about 9 x 13 inches with baking spray. Or, pour a bit of olive oil in it and roll the chicken pieces in it. Either way, coat the chicken with a little bit of olive oil. 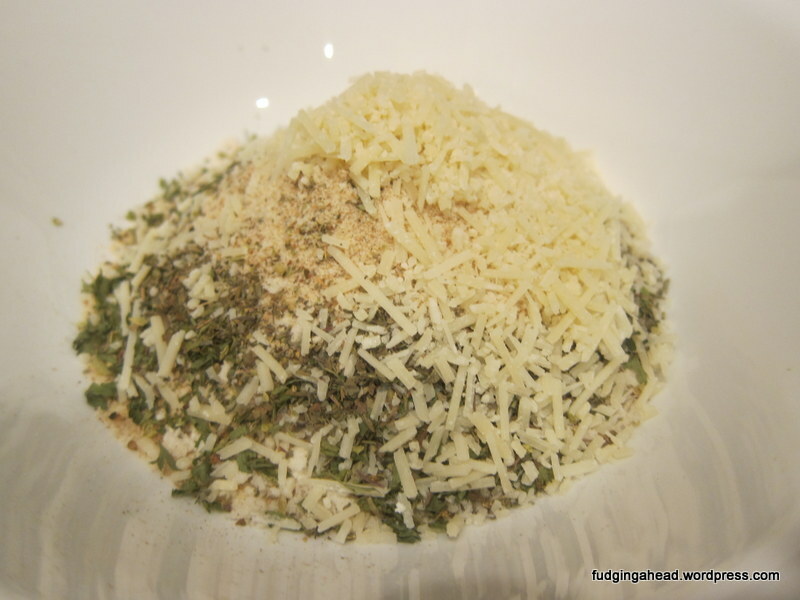 Stir together the bread crumbs, panko crumbs, parmesan, and seasoning. Coat the chicken in that mixture, then place in the baking dish, spaced out if possible. Pour the tomato sauce on top. 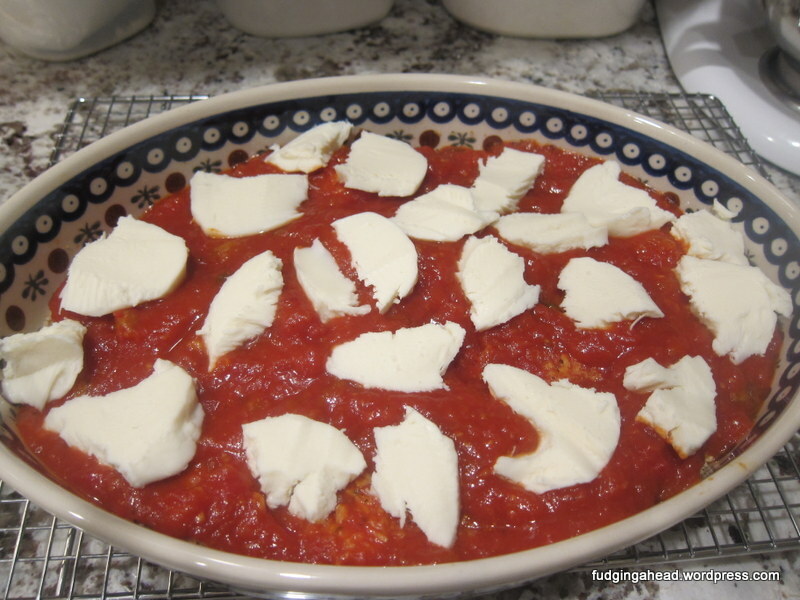 Place the mozzarella slices evenly on top. Bake for about 30 minutes, until the chicken is cooked through. Top with some parsley, if desired. Preheat the oven to 350 degrees. Prepare a baking dish about 9 x 13 inches with baking spray. Or, pour a bit of olive oil in it and roll the chicken pieces in it. Either way, coat the chicken with a little bit of olive oil. 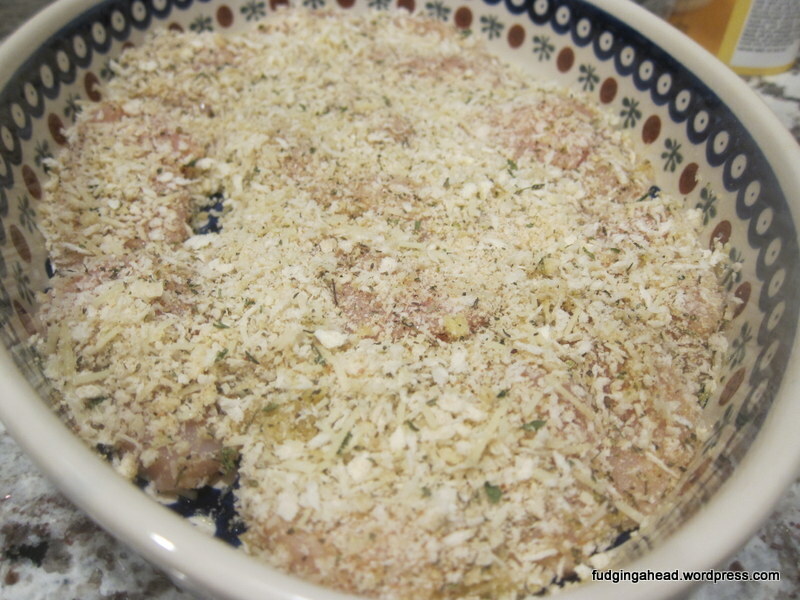 Stir together the bread crumbs, panko crumbs, parmesan, and seasoning. Coat the chicken in that mixture, then place in the baking dish, spaced out if possible. Pour the tomato sauce on top. 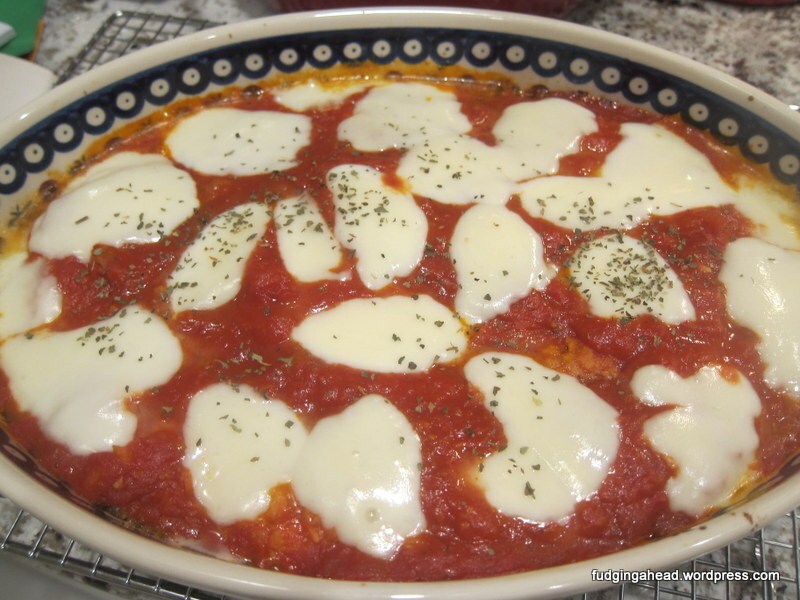 Place the mozzarella slices evenly on top. Bake for about 30 minutes, until the chicken is cooked through. Top with some parsley, if desired. Serve! – Happy Birthday to your Dad! – Easy and delicious dish is always a welcome. You have made it deliciously, and I almost can smell its fragarance! It’s a good day to have a birthday! 🙂 Thanks for the praise! I will definitely remember the olive oil tip. Thanks for sharing! Yum, chicken parm is so good…my son loves it (particularly, the mozzarella) but I don’t make it that often because I have to brown the chicken in the skillet first and it becomes a project. Are you telling me I don’t need to do that?! Had no idea! I have to try that and the oil instead of egg trick. Happy birthday to your dad!! Yes, I guess I am telling you that you don’t need to do that! 🙂 I’m excited that I could make dinner easier for you. I’ll get you to do the sauce next! 😀 I’m so glad the baking method worked for you! I just made This Amazing Dish And It Was So Good! I Love How Easy It Is! Thanks! So many great compliments. 🙂 I love hearing that you liked it, and that it was easy!